Remember when colonial Americans used to lead miscreants into the public square and put them in the stockades for a whole day, so they could be mocked and gawked at as an example of what happens when you transgress? Well, in Utah, the land that the Book of Mormon built, a judge recently ordered a totally vintage, eye-for-eye type punishment when he told the mother of a 13-year-old girl who'd cut a toddler's hair in a McDonald's to either hand her daughter over for an extra 150 hours of detention, or cut the girl's ponytail off. According to Desert News, District Juvenile Judge Scott Johansen dreamed up a public haircutting as a way for Valerie Bruno to reduce her daughter Kaytlen Lopan's sentence by 150 hours. Lopan and an unnamed 11-year-old girl admitted to cutting a 3-year-old's hair in a McDonald's, so you can definitely see where Judge Johansen would think that the only thing that would set the universe back in order was if the shears were turned on the shearers (the 11-year-old was allowed to have her hair cut at a salon, which doesn't seem like a punishment so much as, you know, a haircut). 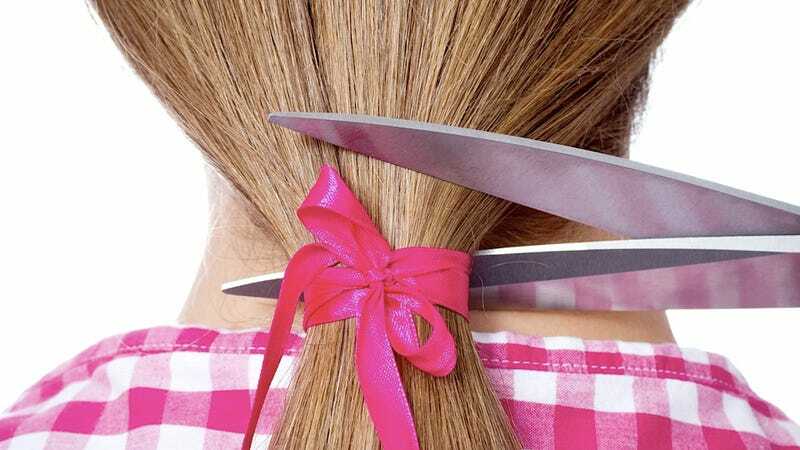 Bruno was understandably freaked out when Judge Johansen ordered her to cut her daughter's ponytail off in the courtroom, but said she felt intimidated under the severe glare of Old Testament justice. "I guess I should have gone [sic.] into the courtroom knowing my rights," Bruno said, "because I felt very intimidated. An eye for an eye, that's not how you teach kids right from wrong." No, it really isn't. It is, however, a great way to build resentment and create a never ending cycle of violent retribution, until, before you know it, Mercutio's dead and it's a damn shame because he's easily the most entertaining character in the whole play. Judge Johansen also asked Mindy Moss, the mother of the recently shorn toddler, if her hair-lust had been satisfied (it wasn't), which also seems like the exact right way to carry out justice in ancient Babylon and the exact wrong way to do it in 21st century America.